This example demonstrates dask_ml.wrappers.ParallelPostFit. A sklearn.svm.SVC is fit on a small dataset that easily fits in memory. 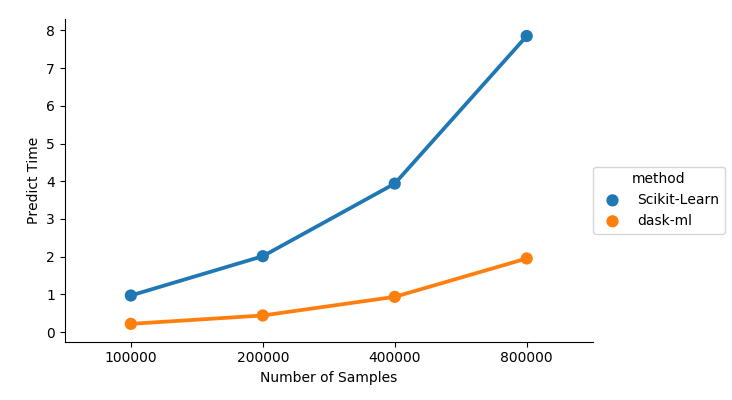 We see that the parallel version is faster, especially for larger datasets. Additionally, the parallel version from ParallelPostFit scales out to larger than memory datasets. While only predict is demonstrated here, wrappers.ParallelPostFit is equally useful for predict_proba and transform. © Copyright 2018, Tom Augspurger. Revision 1adcb4a6.